Tunnelling will be used as a solution in the case of Bonbeach and Edithvale. However, in Seaford a rail bridge has been touted as an idea. Tunnelling cannot always be used as a solution in coastal areas due to the danger of groundwater rising to the surface, and disrupting the natural environment nearby which includes protected wetlands. However this has angered local protesters, who claim that a ‘rail bridge’ is just another word for the controversial Skyrail. Brand new stations will also be constructed along with the removal of the level crossings. 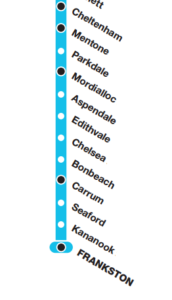 Moreover, Seaford’s investment does not stop at the station, as the local area will receive $10 million in funding. This promises to reinvigorate cycling areas, walking and running paths and local sports clubs. A rail bridge is being used in Rosanna, and has been in use in Glenferrie, among other areas, for many years. Protesters in the Frankston and surrounding areas claim that Skyrail ‘impacts on family homes’, due to reduction of light, reduction of home property value and general disruption to people and businesses located close to the station. However, as mentioned in a previous article it is claimed by the state government that more homes and businesses will likely have to be acquired for tunnelling than they would for a potential above ground project. Local residents have been extensively consulted in the process, and scientists and engineers have also assessed the area on which is the best design to use. As local state members are holding seats by a slim margin, the state government seems eager to appease long-term residents of the area. Furthermore, as the government did not anticipate the controversy that would surround the elevated rail project, the word ‘Skyrail’ has been carefully avoided in recent press releases. The concrete plan for Seaford is still not completely clear, but since construction begins next year, it is due to be completely released to the public shortly. Each level crossing project individually can potentially create up to 200 jobs. Considering that Seaford is due to start in 2018, with Bonbeach and Edithvale starting not long afterwards, this could mean long-term job security for many people in the rail and construction industry.